2 8 Calvin Rose, Jr.
17 1 Billy Childs, Jr.
Oxford, Maine – Shawn Martin of Turner made his first start in an Oxford Championship Series Pro Late Model a successful one Sunday afternoon, driving from the rear of the starting field to the front of the pack, claiming victory in the 40-lap headliner at Oxford Plains Speedway. Skip Tripp of Poland scored his first victory of the year in the 30-lap Allens Coffee Flavored Brandy Street Stock feature race. Lisbon’s Nik Coates wired the Allen’s Cofee Flavored Mini Stock division’s 30-lapper, while the Ripley & Fletcher Ford Outlaw Sportsman division honors went to Corey Morgan of Lewiston for the second consecutive week. Martin, a proven champion in the recently-upgraded Late Model class, skipped the Championship Series opener, and had to start the main event behind all cars racing the previous week. Martin admitted that fresher tires on his car certainly helped in his run to victory lane. Gary Chiasson of Peru bolted from his front row starting spot to a lead of about a straightaway’s length before a caution period tightened the field a bit past the halfway point. After working his way through traffic in entertaining fashion, the previous week’s winner, Dale Shaw of Center Conway, New Hampshire, got by Chiasson following a spirited battle. Shaw’s drive to the front apparently ran afoul of race control, and after being shown the black flag, Shaw retired to the pit area, handing the lead back to Chiasson. Martin, who started a couple of positions behind Shaw and had taken a more conservative approach than the former NASCAR champion in his move toward the front of the pack, soon caught Chiasson, got by, and pulled out to a victory margin of just over one second. OPS newcomer Kevin Douglass of Sidney continued to impress, scoring a third-place finish in just his second start at the Route 26 oval. TJ Brackett bounced back from a mid-race pit stop to post a fourth-place finish, with Donnie Wentworth of Otisfield rounding out the top-five. Former division champion Skip Tripp of Poland jumped from a front row starting position into an early lead he would not relinquish, cruising to an easy victory in the Street Stock 30-lapper. Tripp’s closest rival as the checkered flag waved was Matt Williams of Brownfield, who made a last-lap move on the outside of Dixfield’s Ryan Robbins to claim runner-up honors. Despite Williams’ impressive drive and second straight podium finish, he claims to be unhappy with his car’s performance. Robbins did salvage a trophy-earning spot at the line. The previous week’s winner, Kurt Hewins of Leeds, was close behind in fourth, with the final top-five position earned by Corey Morgan of Lewiston. 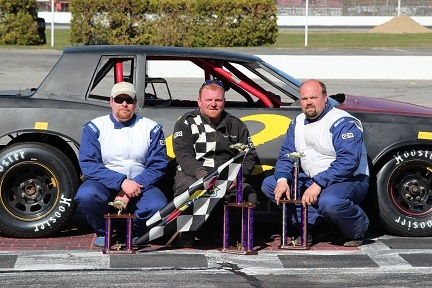 Competing in two divisions, busy Lewiston racer Corey Morgan became the only driver to kick off his Championship Series campaign with two straight victories in a competitive 25-lapper for the Outlaw Sportsman class. It wasn’t as easy as his near wire-to-wire score on Opening Day for Morgan, who started from 14th position and had to keep the hammer down throughout the main event, holding off 19th-place starter Guy Childs of Turner, who was making his first appearance of the season. Childs made a couple of bold, three-wide moves in his march through the field, but couldn’t capitalize on a late-race restart and settled for runner-up honors before failing post-race inspection. Kyle Hewins of Leeds also moved through traffic nicely, gaining eleven positions from his starting spot to earn the eventual runner-up finish. 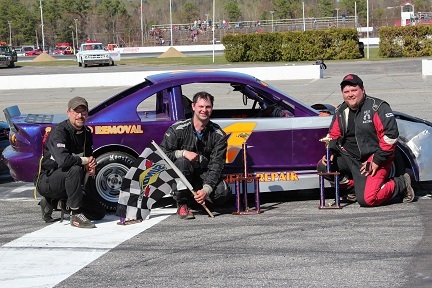 Mike Haynes of Livermore Falls and Auburn’s Kyle Treadwell both drove from outside the top-ten in the early-going to finish third and fourth under the checkered flag, with Auburn's Scott Hethcoat rounding out the top five. 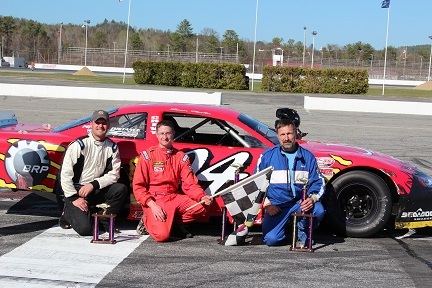 Oxford Championship Series competition continues Sunday, May 12 at 2:00 p.m., with the final afternoon program of the Spring schedule on tap, with racing in the Pro Late Model, Street Stock, Mini Stock and Outlaw Sportsman divisions. 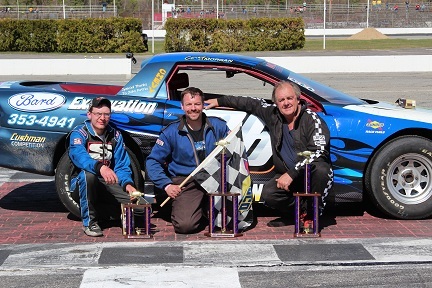 Oxford Championship Series racing moves to a weekly Friday night schedule beginning May 17, with Post Time set for 7:15 p.m.
Oxford Plains Speedway is located at 877 Main Street (State Route 26) in Oxford, Maine. For more information please visit oxfordplains.com or call (207) 539-8865. 3rd Shane Kaherl, 1st Nik Coates, 2nd Calvin Rose, Jr.